Please visit our website at www.afnconvention.com for all the details! 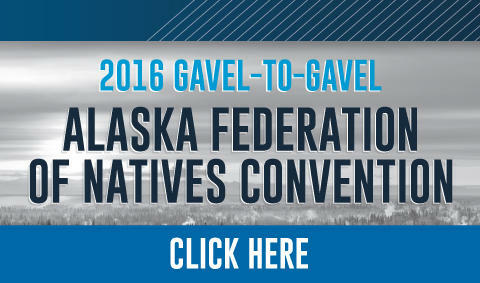 On October 20, 21 & 22, 2016 KNBA News and Native Voice One produced the live broadcast of the Alaska Federation of Natives convention. The convention was at the Carlson Center in Fairbanks, Alaska. KNBA News anchor Joaqlin Estus hosted the live broadcast of all the main podium activity between 8:00 am - 6:00 pm on October 20 & 21 and 8:00 am - 4:00 pm on October 22nd. KNBA News and NV1 also produced a daily one hour show called Alaska's Native Voice hosted by Antonia Gonzales (National Native News). This year three special short-features will air throughout the Live Feed which are designed to recognize AFN's 50th Anniversary. 2016 AFN Broadcast Team: Joaqlin Estus producing/hosting the Live Gavel-to-Gavel Feed, Antonia Gonzales and Emily Schwing hosting/producing the daily one hour show 'Alaska's Native Voice'; Zach Hughes hosting/producing the daily 5 minute AFN Newscast; Frank Chythlook producing short-features; Shyanne Beatty and James Dommek, Jr. leading social media content. Tune in to 90.3 FM throughout South central Alaska or stream live at www.knba.org.